Concessioners, private individuals, and the National Park Service constructed a variety of buildings in park areas over the past 110 years. Some of these buildings fell into the mainstreams of American architecture; the architects of these buildings pulled their ideas out of prevailing stylistic tendencies. Other architects looked toward nature and allowed the surrounding landscape to influence their designs. The high point in the development of this "rustic" design ethic occurred in the late 'twenties and spread throughout the nation during the work-relief programs of the Depression. Other outstanding examples of American architecture came into the National Park System as new areas were added or when new facilities were built. This study explored all of those categories and sought out those with potential national significance in architecture. constructed for visitor-use, interpretive, or administrative purposes. The Early Years. The earliest post-settlement buildings in national park settings, or in areas that later became national parks, for the most part possessed architecture built without strong concern for the surrounding natural resources. When the U.S. Army began their occupation of Yellowstone in 1886, for instance, they constructed Fort Yellowstone with building plans and details similar to those in their other military facilities. At the turn of the century the floor of the Yosemite Valley was cluttered with a haphazard village development that had sprung up to serve the needs of its residents and the hearty visitors who made it to the park. Unfortunately, the village development had been built without concern for the scenic qualities of the area or its natural resources. The Wawona Hotel in the foothills to the southwest of the Yosemite Valley fared somewhat better as it gradually expanded with a sense of formal design and order in its architecture and planning. The development of Bathhouse Row at Hot Springs National Park (then a Reservation) followed a formal, linear pattern established by the area's topography and geology and strongly enhanced by the formal landscape work completed by the Department of the Interior. The bathhouses themselves tended to follow architectural styles in vogue at the time they were built. None of these efforts put concern for the sensitive park landscapes ahead of staid nineteenth-century architecture. Some precedents in architectural theory existed that considered harmony of a building with the landscape. The most important of those ideas came from horticulturalist and landscape architect Andrew Jackson Downing. He thoughtfully investigated the place of architecture on the landscape during the mid-nineteenth century, but he based his architectural solutions on a romantic and picturesque view of nature. He felt that architecture and landscape should promote harmony, beauty, and "moral significance" in peoples' lives. Yet his proposed architectural solutions remained steeped in the nineteenth century. In short, people built what they knew. They built what was culturally comfortable, technically possible, and, in most cases, pleasing to their formal Victorian sensibilities. The concept of national parks was brand new, and concern for the aesthetic well-being of these places set aside for their special features had yet to develop. Big Business and Other Interests. The railroads began the first major concession developments in national park areas. The railroads, all hoping to increase passenger traffic on their main lines, provided adequately comfortable lodgings at their park destinations; but in the very early years they provided little other than haphazard accommodations such as tent cabins, or hotels designed out of the mainstreams of American architectureQueen Anne or Stick Style buildings that could have "fit" into a variety of urban or rural settings. The big change occurred when the Northern Pacific Railroad constructed Old Faithful Inn (1903-4) at Yellowstone National Park. Old Faithful Inn, built near the geyser from which it took its name, was the first of the railroad-funded hotels to provide an exceptionally distinct architectural character. 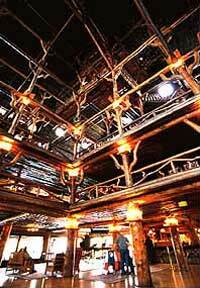 The building, with its soaring rustic lobby and gnarled log balconies, was unlike any hotel that had come before. Hotels in park areas had been constructed, up until this time, in relatively common nineteenth-century styles. Old Faithful Inn, on the other hand, possessed a wild, frontier feeling created by the architect's extravagant use of logs. Visitors revelled in the variety of rustic spatial experiences the lobby presentedspaces as intriguing and on as grand a scale as the surrounding landscape. Truly Old Faithful Inn was a building worthy of its awesome natural setting; and in the eyes of its guests it was worth writing home about. Not to be outdone, the Atchison, Topeka, and Santa Fe Railway also realized the enormous potential for using architecture as a marketing strategy. After all, Old Faithful Inn had created a special ambience unique to Yellowstone. The Santa Fe set its sights on the south rim of the Grand Canyon, not yet a national park, but a marvelous scenic wonder close to the main line of the Santa Fe. The Santa Fe and its concessioner the Fred Harvey Company accommodated the visitor use pattern of lengthy stays at the Grand Canyon by building their grand hotel, El Tovar (1905), and a replication of a Hopi pueblo adjacent to it. The guests could amuse themselves by watching the Indian dances and craft demonstrations at Hopi House (1905), and at the same time learn about the exotic cultures by studying the rich interior design and architectural detail that architect Mary Colter provided. After arriving by train at the log depot (1909), visitors could get established at El Tovar and then travel by stage and later by touring car east and west along the rim and enjoy Colter's medieval-feeling Hermit's Rest (1914), the Lookout (1914) that seemed a part of the surrounding rim geology, and in later years the mystical Indian Watchtower at Desert View (1931). In northern Montana just below the Canadian border, the Great Northern Railway completed a series of Swiss-inspired hotels and chalets (ca. 1913) at Glacier National Park to promote the "American Alps." Using a single architectural style, the Railway created a rugged alpine image for their structures. The builders of Lake McDonald Lodge, also within the park boundary, copied the Chalet style, which helped its absorption into the Great Northern system when it was bought out in the 1930s. The special silvery quality of the weathered wood of Paradise Inn (1916) at Mount Rainier created its outstanding character. Financed by a group of local businessmen who lacked the seemingly unlimited funds of the powerful railroads, this Inn was constructed on a smaller scale than most of the others, but with a subtle yet powerful architectural presence that fulfilled its purpose as the hub alpine climbing and one of the earliest ski resorts in the country. The quieter presence of the Sierra Club in Yosemite National Park in the beginning of this century brought with it two equally subtle structures. Based on a more intellectual approach to architecture fostered by Bernard Maybeck, both LeConte Memorial Lodge (1903, rebuilt 1919) and Parsons Memorial Lodge (1915) began with simple, native materials and distinctive building sites from which the architects determined the designs. While some overtones of European architecture filtered into the buildings, the underlying approach of allowing the site and materials to determine the designs remained dominant architectural forces. A metamorphosis in architectural thought was beginning. Railroad architects at first worked from the mainstreams of American architecture. As the railroads pushed to develop these natural areas they hired creative geniuses like Robert Reamer and Mary Colter who were masters in making architectural spaces create the image and sense of place that, from the railroads' points of view, sold more passenger tickets to these exotic places. The architects became extremely creative in drawing influences from romantic, nostalgic styles and had the railroads' money to experiment in their work. Yet the strength of the natural landscape was having an overwhelming effect on the shape, form, and style of the architecture, as noted in the Sierra Club buildings constructed with donated funds. The concept that the land could shape the architecture was taking hold. The New National Park Service. The legislation establishing the park service required both preservation and visitor use of the park lands, which of course meant buildings to support the administrative and visitor-use functions. Early directors Stephen T. Mather and Horace Albright also knew that higher visitation in these remote areas increased popular support for the parks. At the same time they recognized the effects of unbridled development in these scenic areas. The difficult task for establishing some aesthetic guidelines for park architecture and development lay ahead. Two organizations that had lobbied for the formation of a bureau of parks had strong effects on the physical development of park areas after the creation of the Service in 1916. These were the American Civic Association and the American Society of Landscape Architects. Due to their interest and strong concern for the aesthetics of the landscapes in these natural areas, the first "Statement of Policy" issued by the Service called for harmonizing improvements such as roads, trails, and buildings, with the landscape. The statement also called for the employment of trained "engineers who either possess a knowledge of landscape architecture or have a proper appreciation of the aesthetic value of park lands," and for the completion of comprehensive plans for development of park lands. This statement of policy laid the groundwork for all architectural design in national parks until World War II. The new agency also had review authority over all developmentsprivate and publicin park lands. While some existing developments within park boundaries possessed quality design, most were transient and informal in character. The staff of the new agency took their review authority seriously. Neither they, nor the railroads wanted to repeat the devastation of these scenic areas for the sake of development that they had seen at Niagara Falls during the nineteenth century. The railroads had economic reasonsthey wanted special places with special images and senses of place to sell tickets. The park service approached it from aesthetic concerns tempered with idealism. Both the monied private developers and the new federal agency realized that keeping these awesome scenic areas special through appropriate development was in their best interests. Director Stephen T. Mather felt so strongly about having architecture built in harmony with the landscape in his national parks that he contributed a substantial sum to the service for the construction of the Rangers' Club (1920) in Yosemite Valley. Although its style was not emulated in later rustic buildings, its materials, finishes, dark, woodsy feeling, and steeply pitched roofs helped it fit with its setting. Archeologist Jesse Nusbaum took a different approach with the buildings he and his wife Aileen designed for Mesa Verde National Park (1921+). Both were involved with the preservation movement in the southwest, centered in Santa Fe. Nusbaum's pre-occupation with the archeological aspects of his park led him to design structures that were in harmony with the prehistoric cultural setting of his park. His choice of a pueblo style based on the surrounding Anasazi structures guided all of the development of the park. Nusbaum used the indigenous building materials, as the Anasazi did, which served almost as a protective coloration in harmonizing the structures with their setting. During the mid-1920s a Los Angeles architect named Gilbert Stanley Underwood took these concepts of rustic architecture that had developed and created entire village developments at Bryce (1925), Zion, and the north rim of the Grand Canyon (1927+) for the Union Pacific Railroad and the Utah Parks Company. For materials he used logs and log slabs, and rough, angular stones with steel and concrete hidden beneath. He also expanded the concepts into megalithic proportions in the Ahwahnee (1925) at Yosemite, where he toned and formed exposed concrete to imitate wood. Underwood's rustic structures added new dimension to the term "rustic." Another important architectural product constructed by a concessioner during this era was the Grand Canyon Power House (1926) on the south rim. Built to provide power to all of the facilities on the south rim, this building housed enormous industrial equipment. To diminish the size of the building necessary to contain the equipment, the architect (as yet unknown) used familiar architectural elements of the chalet style and nearly doubled their size. This technique cut the perceived size of the building in half. Thus, besides experimenting with natural materials, the concessioner architects began to experiment with scale and perception. During the mid-1920s landscape architect Thomas C. Vint assembled a small group of highly creative young men to work for him in the National Park Service Landscape Division, later the Branch of Plans and Design. Vint hired people willing to seek out those design elements in their work which made the buildings necessary for park development as unobtrusive and harmonious as possible in their park settings. Vint's team of architects and landscape architects experimented with materials such as stone and logs, and with ways of shaping those materials into structures that "belonged" in the often awesome natural surroundings. The designers and onsite construction supervisors carefully studied the natural materials in the surrounding landscapethe color, scale, massing, and textureand incorporated what they could into their designs. Building on the traditions of an environmental architecture set down by architects such as Mary Jane Colter and Bernard Maybeck, the park service architects and landscape architects tailored each master plan and each building in the plan to the specific park site and its individual needs. In Longmire village at Mount Rainier landscape architect Ernest A. Davidson chose the rounded, glacial boulders and large logs as the exterior materials on his administration, community, and service-station buildings (1927+). While the boulders and logs were oversized compared to those used in typical building construction, they were the same large scale as the boulders and logs of the surrounding landscape. The 1929 Park Operations Building at Grand Canyon followed the same design philosophy. The big chunks of rubble masonry laid in courses mimicked the local geologic strata, and the log detailing had sizes identical to the trunks of the surrounding forest. Perhaps the most ambitious rustic development of this period was in the Munson Valley district of Crater Lake National Park. 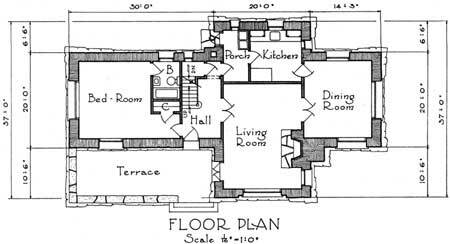 Although most of the structures of that development have been altered over time, the Superintendent's Residence (1930) illustrated the classic elements of the design ethic. At Yellowstone National Park architect Herbert Maier designed three museums (1929+) donated to the park by the Laura Spelman Rockefeller Foundation and the American Association of Museums. Maier's museums were unusual. The buildings had a few elements common to bungalow structures of the periodbattered stonework, clipped gables, and low, horizontal emphasesbut Maier left many of the materials in a more natural conditions that reflected the scale and roughness of the surrounding landscape. His buildings responded to their sites in their low shapes and appropriately fit the contours of the site. Maier's buildings were perfect solutions for an architecture appropriate to the outdoors: informal, through their use of natural materials and horizontal lines, but loaded with a strength of design and heavy-handed expression that subconsciously suggested the smallness of man in relation to nature. Back at Mount Rainier in 1930 landscape architect Davidson designed log blockhouses and a stockade for the Yakima Park (Sunrise) area. Davidson wanted to emphasize the historic use of the sub-alpine meadow as an Indian summer rendez-vous point, so he sought a cultural theme for the area's development. Finding no suitable permanent structure from local Indian architectural traditions, he turned to a nostalgic, frontier theme in his blockhouses and stockade. Colter and Nusbaum had successfully used cultural themes in their structures at Grand Canyon and Mesa Verde; harmonizing a development with its cultural setting, Davidson theorized, was another way of having a structure belong in its environment. The strides in park architecture were enormous from the turn-of-the-century through the 'twenties. Concessioners had money to hire creative architects and give them large budgets to design image through the device of architecture. They could experiment with applied decoration, vast interior spaces, and architectural fantasiesand they did. The tiny budgets allotted for park service buildings only reinforced the new tendency park service architects and landscape architects already hadto look toward nature. These special natural areas each needed special architecture which would maintain the areas' uniqueness. They needed buildings that harmonized with their natural settings so well that they seemed to grow out of them. As one park service landscape architect of the period pointed out, none of the staff had any background in this type of design. They had been taught to build structures which stood out in the landscape but under the direction of Tom Vint the architects and landscape architects re-learned their approaches to architecture and instead designed buildings that belonged in their environments. This simpler architecture, too, projected imagethe image of an agency with roots in the preservation of America's natural heritage. The Depression: Work-Relief Programs and the National Park Service. In 1933 the National Park Service was designated to supervise the development in state, county, and metropolitan recreation areas under the Emergency Conservation Work Act. Taking on this new responsibility in addition to the agency's own commitment to development meant expanding the staff to design and supervise construction of these new facilities. Successfully handled, [rustic] is a style which, through the use of native materials in proper scale, and through the avoidance of rigid, straight lines, and oversophistication, gives the feeling of having been executed by pioneer craftsmen with limited hand tools. It thus achieves sympathy with natural surroundings and with the past. Bandelier National Monument had its entire development designed following this philosophy. Beginning in 1933 architect Lyle Bennett and landscape architect Charles Richey designed the administrative, maintenance, residential, and tourist facilities based on the layout and architectural style of a small New Mexican pueblo. The simple stone structures, built by the Civilian Conservation Corps, formed a cohesive village fabric around a plaza. The architects and landscape architects out of Vint's Branch of Plans and Design repeated southwestern cultural themes in the Region III Headquarters Building in Santa Fe (1937), the Tumacacori Museum (1937) at Tumacacori National Monument in southern Arizona, and the Painted Desert Inn (1937) at Petrified Forest. In Yellowstone the architects chose logs as the material for the Northeast Entrance Station (1935). This handsome building, with its highly expressive use of logs, served as the definite entrance to the park that would help the visitor realize that he was entering a special place. The entrance station, like so many others of its kind, subconsciously reinforced the visitor's sense of the western frontier and the wilderness he was about to enter. One remarkable development of this period was at Oregon Caves National Monument. The main Chateau (1934), built across a small gorge and with a stream running through its lower floors, was constructed by the monument's concessioner, while the surrounding site design was designed by park service landscape architects and executed by the Civilian Conservation Corps. All followed the design philosophy laid out by Vint and his staff. While construction in national parks in the 1930s stressed the precepts set forth in Park and Recreation Structures, urban areas used the boon of federal monies for different pursuits more appropriate for urban environments. The city of San Francisco used Works Progress Administration funding to construct Aquatic Park near Fishermen's Wharf. The Streamlined-Moderne style development featured a bathhouse, concessions stands, municipal pier, and other facilities all possessing the smooth, arced lines of the style. Even the landscape's crescent shape fit with the style. Toward the end of the 1930s rustic architecture was falling out of favor for buildings in national parks. New materials and building techniques, and the cleaner lines of the International Style beckoned the architects who felt that most rustic buildings had too much of a Hansel-and-Gretel feeling to them. Funding for the work-relief programs diminished as the nation drew closer to World War II, and consequently the abundant supply of men to peel logs and haul boulders decreased. The labor-intensive aspects of rustic construction were all the more reason to look toward cheaper methods of building in the future. When the war came the design ethic of rustic architecture had seen its heyday. After World War II. Virtually all construction within the parks came to a halt during the War, and when it ended funds for park development were meager. The first major park development after the war was at Jefferson National Expansion Memorial National Historic Site in St. Louis. Private funds raised by local citizens financed a design competition in 1947 for a suitable structure to represent St. Louis' place as the Gateway to the West. Architect Eero Saarinen won the competition with his monumental and highly expressive stainless-steel arch. Although construction was not completed on the Arch until 21 years later this avant-garde design fit its urban setting. The new age of architecture in new types of park areas began. The simplest breakdown of these proposed landmark structures is chronological. A chronological approach allows architectural advances in the public and private sector, and the interaction between the two, to become more evident. 1876Wawona Hotel and Thomas Hill Studio, Yosemite National Park. This group of wood-frame structures are of mainstream, rural-California architectural styles laid out in a relatively formal pattern. Remarkable aspects of this group are its position as the largest existing Victorian hotel complex within a national park, and one of the few remaining in the United States with this high level of integrity; its 110 years of continuous use as a hostelry; and its significance as the studio of landscape painter Thomas Hill during the last 22 years of his life. 1892Bathhouse Row, Hot Springs National Park. Bathhouse Row is the largest collection of bathhouses in the United States, and what remains of the only federally-run spa. The bathhouses are the third and fourth generations of bathhouses along the linear development of Hot Springs Creek, and some sit directly over the hot springsthe resource for which the area was set aside as the first federal reserve in 1832. The bathhouses are an excellent collection of turn-of-the-century eclectic buildings in neoclassical, renaissance-revival, Spanish, and Italianate styles, aligned in a linear pattern with formal entrances, outdoor fountains, promenades, and other landscape-architectural features. The buildings also are illustrative of the popularity of the spa movement in the United States in the nineteenth and twentieth centuries. 1903Old Faithful Inn, Yellowstone National Park. Old Faithful Inn is the first building in a national park constructed in an architectural style parallel to and harmonious with the grandeur of the surrounding landscape. This enormous log and frame hotel, built a short distance away from Old Faithful Geyser, displays a woodsy sense of Adirondack rustic architecture blown up to enormous proportions. Architect Robert Reamer, working for the Northern Pacific Railroad, created a masterpiece in gnarled logs and rough-sawn wood that far surpassed the railroad's expectations for creating a special hotel with a sense of place as identifiable as the park itself. The building's seven-story log lobby is unique in American architecture. 1903LeConte Memorial Lodge, Yosemite National Park. 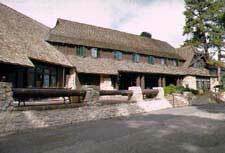 LeConte Memorial Lodge is a transitional building in twentieth-century American architecture, with strong European roots in its Tudor Revival design, and a revolutionary use of building materials and architectural forms found in work of architects of the Bay Region tradition. The architect, John White, brother-in-law of architect Bernard Maybeck, allowed the materials and the site to determine the design of the building. Originally constructed in 1903 and then moved and rebuilt in 1919, the building was the principal foothold of the influential Sierra Club in the mountains from which they took their name. The building is outstanding for its unusual design and theory. 1905Hopi House, Grand Canyon National Park (Colter nomination). This replication of a Hopi pueblo by architect Mary Jane Colter brought the "tourist attraction" aspect of Indian cultures to the destination resort of the south rim of the Grand Canyon. Colter based her design on months of study of pueblo structures at Oraibi, on Third Mesa in Hopi land. Colter strove for an archeological correctness in this building which she augmented with Indians who lived in the structure. The Fred Harvey Company and the Santa Fe Railway encouraged this type of exoticism at their resort. Built directly across from the luxurious El Tovar hotel, the design of Hopi House was also a product of a movement in the southwest to preserve tangible aspects of Indian cultures. 1905El Tovar, Grand Canyon National Park. This eclectic buildinga combination of "Swiss chalet and Norway Villa" according to the railroad brochures, is a transitional structure that bridged the gap between the staid Victorian resort architecture of the late nineteenth century and the rustic architecture later deemed appropriate for the great scenic and natural wonders of the United States. As the Santa Fe Railway's Great Hotel next to the canyon rim, the building became the focal point for the railway's destination resort. 1909Grand Canyon Depot, Grand Canyon National Park. This is the only remaining log (structural log) railroad depot in the United States, and one of a handful of rustic depots ever constructed. As the first building rail passengers encountered when getting off the train, the depot established the rustic sense of place of the Grand Canyon, so painstakingly developed as a "destination resort" by the Atchison, Topeka, and Santa Fe Railway. 1913Great Northern Railway Buildings, Glacier National Park. What remains of this system of hotels and chalets inside the park boundary is probably the largest collection of Swiss chalet structures in the United States. This type of development in an American park setting is uniqueit is the only instance in which one distinct architectural style is used on such a massive scale for a concessions development, and the only instance in which a European system of hostelries built a days' hike or ride apart is used. 1913Lake McDonald Lodge, Glacier National Park. This building is one of the finest examples of Swiss chalet hotel architecture remaining in the United States. 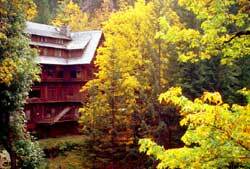 Its inclusion as a later addition to the chalet system of the Glacier Park Hotel Company is another aspect of its significance. 1914The Lookout, Grand Canyon National Park (Colter nomination). In this building Colter allowed the precipitous edge of the canyon rim and the natural rock outcroppings to give form and shape to the architecture. This is the first building in what became a national-park area to appear to grow out of the landscape. Colter 's sensitive approach to the rugged site and her use of stone in natural shapes and laid in natural-looking beds mimicked nature and served as a prime lesson in creating architecture harmonious with the landscape. 1914Hermit's Rest, Grand Canyon National Park (Colter nomination). While the Lookout had no applied decorationits beauty was based on its rugged stonework and sensitive site designHermit's Rest retained many aspects of a medieval fairy-tale fantasy. The stonework and site design on the exterior were rugged but had hints of nostalgia. The stone entrance arch with its antique bell established the ambience that culminated in the semi-domed stone hearth space that had the atmosphere of a primitive castle. 1915Parsons Memorial Lodge, Yosemite National Park. This simple structure is a straightforward response to the materials and the environment. The harsh climate at that site high in the Sierra Nevada prompted the highly expressive use of basic forms and simple, natural materialscharacteristics indicative of progressive contemporary architecture of the San Francisco Bay area as seen in the work of Maybeck and others. The building's design is in large measure determined by the site and materials, and not by style. 1916Paradise Inn, Mount Rainier National Park. This rustic hotel, built on a smaller scale than Old Faithful, has a peculiar shimmering silver quality caused by the use of timbers that weathered naturally for 30 years before they were used in the construction of the building. Unusual additions to the building are the rustic furnishings in the lobby that have a hand-crafted artistry and gothic feeling reminiscent of northern-European woodwork. This inn was part of one of the earliest ski resorts in the United States. 1920Rangers' Club, Yosemite National Park. Personally funded by Director Stephen T. Mather, the building is representative of his commitment to an architectural aesthetic appropriate for the park lands that he was charged to manage. The foundations of that aesthetic guided the design of park building through World War II. 1921Mesa Verde Administrative District, Mesa Verde National Park. These were the first buildings constructed by the National Park Service to experiment with architecture based on cultural traditions represented in the park area. The principal designer, archeologist Jesse Nusbaum, believed that the structures not only fit with their natural and cultural setting, but also could be used for interpretive purposes to explain the construction of prehistoric dwellings in the park. 1925Bryce Lodge and Deluxe Cabins, Bryce Canyon National Park. Bryce Lodge and deluxe cabins are the work of master architect Gilbert Stanley Underwood and are excellent pieces of the type of rustic architecture encouraged by the National Park Service and built by the railroads. These buildings, the best of what remains of the entire Bryce Lodge complex, were part of the Union Pacific/Utah Parks system that included concessions developments on the north rim of the Grand Canyon, at Zion National Park, and Cedar Breaks National Monument. 1925The Ahwahnee, Yosemite National Park. Designed by architect Gilbert Stanley Underwood, this building is the epitome of rustic monumentality and luxury. The concrete that was formed and stained to imitate wood, the rough granite piers, and the building's chunky, monolithic quality are enhanced on the interior by stained glass-windows and murals in geometric Indian/Deco designs, and other exotic decorative features. 1926Grand Canyon Power House, Grand Canyon National Park. This industrial building within the boundaries of a national park is a masterpiece of trompe l'oeil. The elements of the rugged chalet design are overscaled to fool the viewer into believing that the structure is half its true size. All of the original diesel equipment that provided power to the south rim of the Canyon remains in the building. 1927Longmire Administration Building, Community Building, and Service Station, Mount Rainier National Park. These three rustic buildings of rounded glacial boulders and logs contributed substantially to the development of rustic architecture. The native materials used in the buildings were in proportion with the boulders and trees of the surrounding landscape but were overscaled and larger than those normally used in construction. This tied the buildings in with their awesome surroundings. The subtlety of this approach is the hallmark of the rustic design ethic. 1927/1936Grand Canyon Lodge, Grand Canyon National Park. Grand Canyon Lodge is the most intact rustic hotel development remaining in the national parks from the era when railroads fostered construction of "destination resorts." Built by the Union Pacific Railroad and its subsidiary, the Utah Parks Company, the main lodge building, the deluxe cabins, and the standard cabins of log and stone construction retain their fabric, layout, and ambience. When the main lodge building was rebuilt in 1936 following a devastating fire, some modifications to the original plans changed the building's exterior lines, but the building's most important interior spaces retained their scale, materials, and flavor. 1929Grand Canyon Park Operations Building, Grand Canyon National Park. Like the park-service buildings at Longmire, the Park Operations building took its shape from the surrounding landscape. The "ornament" is the texture of the stonework and its rough courses mimicking the local geology. The low-pitched roofs diminishes the apparent size of the building. The style of the building is created by those natural-feeling forms and native materials that subtly connect the structure with its natural environment. 1929Norris, Madison, and Fishing Bridge Museums, Yellowstone National Park. These classic rustic buildings, designed by Herbert Maier for the American Association of Museums and the Laura Spelman Rockefeller Foundation, served as the models for hundreds of state and county park structures built in the west and midwest during the work-relief programs of the 1930s. Maier's feeling that any building in a national park was a "necessary evil" (his words) forced him to strive hard to make his buildings harmonize with the surrounding landscape. 1930Yakima Park Stockade Group, Mount Rainier National Park. The frontier image of the log stockade and blockhouses depicts the nostalgic aspect of rustic architecture. The thoughtful combination of natural materials in traditional forms transports the visitor back to pioneer days when climbing the enormous peak in the background was considered impossible. 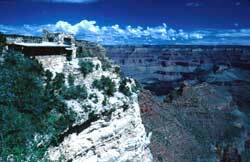 1931Desert View Watchtower, Grand Canyon National Park (Colter nomination). Here Colter returned to a sense of archeology and ethnohistory in her design of this towered overlook, but she endowed the building with so much symbolism and mysticism that she wrote a 100-page explanation of its features for the Fred Harvey tour guides. The interior spaces based on circular forms are particularly noteworthy. 1932Crater Lake Superintendent's Residence, Crater Lake National Park. Originally part of the best-designed rustic development in a national park, this superintendent's residence is the only building of the Munson Valley group that retains its near-original condition, and thus its great architectural integrity and flavor. The building's rustic design is of the highest quality and its unusual method of construction was devised for the extremely short building season. 1933Bandelier C.C.C. Historic District, Bandelier National Monument. This group of 31 buildings is the largest collection of C.C.C.-built structures in a national park area that has not been altered by the addition of new structures within the district. Designed and built to mimic a pueblo, the district illustrates the guiding principles of rustic architecture. 1934Oregon Caves Chateau, Oregon Caves National Monument. The creative use of the extremely limited building site spanning a gorge, the building's style and shaggy bark finish, and the extremely high integrity of the building, the furnishings, and the site make the structure of extraordinary significance. The intimacy of the area is enhanced by stone retaining walls, fishponds, waterfalls, and walkways. Changes to the structure and the immediate site have been so minor that entering the building feels very much like going back in time to 1934. 1935Northeast Entrance Station, Yellowstone National Park. This classic log entrance station is the best of its type remaining in the entire National Park System. It is virtually unchanged. Designed following the parameters of the rustic design ethic, the building subtly introduces the visitor to the special place he is about to enter. The building is not only the physical boundary but the psychological boundary between the rest of the world and the area set aside as a permanently wild place. 1937National Park Service Region III Headquarters Building, Santa Fe. Besides being the largest-known adobe office building and perhaps the largest secular adobe building in the United States, the former Headquarters for Region III is a masterpiece of Spanish-Pueblo Revival architecture. Designed by N.P.S. architect Cecil Doty and constructed by the Civilian Conservation Corps, the building's roots are in the rustic design ethic of park architecture, interpreted here with a cultural theme. The building contains an outstanding art collection: paintings and prints done by members of Santa Fe's art colony in the 1930s; and Pueblo pottery, and Navajo rugs acquired through emergency work-relief funds. 1937Tumacacori Museum, Tumacacori National Monument. This handsome example of Mission Revival architecture was built on a plan mimicking, in part, the spatial layout of a mission complex. Architectural elements such as the entrance doors were replications of similar features from other missions of the Sonora chain, studied during a scholarly data-gathering field trip during the 1930s. This approach allowed the museum and attached courtyard planted with Spanish-colonial flora, to be used as interpretive devices while the structures walled off and protected the areas' prime resource, the remains of the Tumacacori Mission. 1937Painted Desert Inn, Petrified Forest National Park. The artistry of this building sets it apart from other Spanish-pueblo Revival buildings. The interior spaces have unusually high qualities of design, particularly the former Trading Post Room illuminated by a translucent skylight with multiple panes of glass painted in designs of prehistoric pueblo pottery. The murals by the late Hopi artist Fred Kabotie are exceptional, and may be the last murals Kabotie ever painted. 1920-45Aquatic Park, Golden Gate National Recreation Area. Located right on the waterfront of San Francisco Bay (near Ghirardelli Square) this large park has a curving, Streamlined-Moderne design that extends from its buildings through the shape of the landscape. The Moderne style reflects the park's nautical themeeven the main building looks like a 1930s steamship. Although work began on the park in the 1920s, the buildings and the artwork are products of the Works Progress Administration and the Federal Arts Projects of the late 1930s, and they reflect the smooth, clean lines of that period's art and architecture. The complex may be the largest Moderne urban-park complex in the United States. 1947/1963-68Gateway Arch, Jefferson National Expansion Memorial National Historical Park. 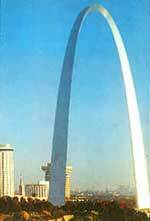 Designed in 1947 and built between 1963 and 1968, the Arch is the largest monument in the United States. Its highly complex and subtle design based on a weighted catenary is unique in architecture, and its structural system had never been attempted on such a large scale. Its symbolic architectural expression is of such simplicity and modernity that even today it remains avant-garde. The Arch, designed by master architect Eero Saarinen, is the planning focal point of the city of St. Louis. Zion National ParkRemaining Lodge Structures. The parade of architectural design within areas of the National Park System began with buildings out of the mainstreams of architecture. The real break into a different philosophy of architectural design came with Old Faithful Inn where architect Robert Reamer created a structure and an image with overpowering connections with the wildness of Yellowstone. Concessioners tended to have their architects design buildings that enhanced their parks' sense of place and left images as memorable as the natural spectacles themselves. National Park Service architects and landscape architects tended to construct more subtle buildings that harmonized with the surrounding landscape or sometimes even receded into it through meticulous use of natural materials in an appropriate scale; through use of forms and massing related to the surrounding topography; and through careful site design. This approach spread throughout the nation during the work relief programs of the 1930s when thousands of state, county, and metropolitan areas benefitted from the construction of park development following this rustic design ethic. After World War II architecture in park areas tended toward modern design, and newer materials and technology. 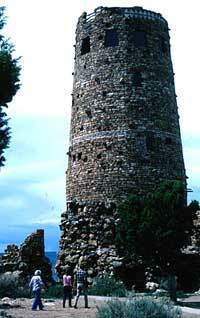 Desert View Tower in Grand Canyon National Park, designed by architect Mary J. Colter. Much of the outstanding architectural heritage of the western national parks was due to the railroads, whose economic interests inspired a fascinating architectural legacy of resort architecture; but perhaps the railroads' greater contribution was to the national parks themselves. The railroads, through their admittedly selfish economic motives, garnered public support and political influence for the National Park idea by bringing throngs of people to these natural wonders. The railroads made the remotely accessible areas easily accessible and sparked interest in expanding the park system. The immediately identifiable National Park Service architecture of the late 1920s and early 1930s was constructed for different purposes than that of the concessioners. Under the leadership of landscape architect Thomas Vint, the park service designers perceived buildings as "necessary evils" in these magnificent park settings, and thus they sought to harmonize the buildings as much as possible with the surrounding environments through a variety of devices. These buildings in a sense created the miniature cultural landscapes that just about any American could identify as "constructed by the C.C.C." when confronted with the rustic stonework in his state park. This pervasive architecture was subtle and consciously humble in designthe result of years of study and experiments. This rustic design ethic left an indelible mark on the American landscape. Of the 30 nominations proposed for Landmark status and listed above, all were west of the Mississippi River. Approximately half were designed and built by concessioners, and the other half designed and built by the National Park Service. The park area with the largest number of nominations was Grand Canyon National Parkwith sixfollowed by the five nominations at Yosemite; three each at Yellowstone and Mount Rainier; and two at Glacier. Perhaps the nominations broke down that way for several reasons. The earliest park areas were west of the Mississippi. The identifiable landscapes of those individual areas, the exotic lure of the romantic west, and the westward emphasis of the railroads encouraged romantic resort architecture in western national parks. Most major park development projects during the 'twenties and 'thirties were in the west. While fine buildings and districts representative of these movements and worthy of preservation remain in the east, these nominations represent the most important architectural advances in national park architecture from the early days in Yosemite through the design of the Arch in St. Louis.